The holidays are a time for giving. So there is no better time than now to use your about.me page to support St. Jude Children’s Research Hospital. And AOL will donate $1 for every page created or updated to support St. Jude through December 31st (up to 10,000 pages). Details on the program below, but first, here’s why we support St. Jude. These are famous words from St. Jude founder and entertainer Danny Thomas, who opened St. Jude in 1962 with the intention of helping children of all races, backgrounds and religions. At AOL and about.me, we have a deep respect for the amazing impact Danny Thomas has had on children around the world. No family ever pays St. Jude for care. St. Jude also covers the cost of travel, housing and meals for each patient and a family member. But this wasn’t always the case. Working together under one roof, St. Jude physicians and scientists have pioneered treatments that have helped push the overall survival rates for childhood cancers from less than 20 percent when the hospital opened in 1962 to 80 percent today. The survival rate for the most common form of childhood cancer, acute lymphoblastic leukemia, has risen from just 4 percent in 1962 to 94 percent today. AOL is a key partner for St. Jude, donating millions in in-kind donations since we began supporting St. Jude in 2006. This year, we donated 20 mobile computing carts so the children can stay in touch with their friends and families. One St. Jude patient used one of the computer labs to Skype with her family back home in Jordan, who could not make it to Memphis to be with her. We’ve created two new background images and added them to Gallery Backgrounds. If you have already have an about.me page, change your background image to one featuring St. Jude and share with your friends on Facebook, Twitter and your email address book. Or, create a new page to raise awareness for the cause with one of the new background images. For every page that is made to support St. Jude, AOL will donate $1 (up to $10,000). Please join us in supporting this great organization and cause. And if you know anyone who you think would be interested in supporting St. Jude Children’s Research Hospital, please forward this post to them. Or, you can also help us support St. Jude by Donating Now! I have done my bit. I hope AOL does theirs. I have updated my profile, good luck guys!!!!!!! 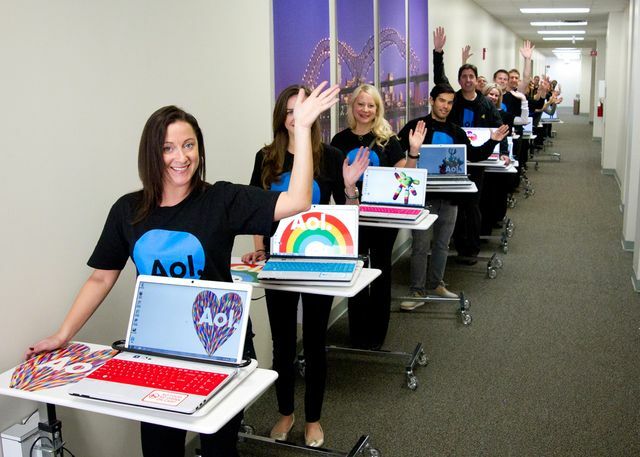 Thanks AOL & About.me for supporting this amazing cause! Happy Holiday’s! Seriously now, AOL, you can afford so much more. I was expecting a few more zeroes at the end of that number. I’ve donated & updated my about.me page! Thanks to AOL for supporting St. Jude Children’s Research Hospital. Hi Ian! If you see, AOL does deliver millions, in different ways. This is just for the campaign with about.me. Thanks! I did it. Support them right now ! Children are my greatest inspiration. My support is a must. We had to be creative: It’s what we do! Thank you so much Aboutdotme, AOL for exposing us to the future of Social Media Power using it for such a worthy cause St. Jude Children’s Research! We’re In! Of course, count with me! I have updated mine too for a so important thing that childrens healthy. Did it! I think St. Jude’s is great! Great cause!!! Happy to change my background. Thanks for the responses! Be sure to include your page url too.